I finished a five week practicum yesterday in a private school here in Auckland teaching a year 8 class of 12 and 13 year old girls. Practicum can be really stressful, not only are you learning but you are being observed all the time and also have a university lecturer come and observe you which is like your practical experience exam. On top of that you also have piles of paper work the university expect you to do, along with lesson planning for your teaching. The rewards are immense though, not just in terms of your own development but also from the relationships you build with your students. One morning I was given this cupcake for my morning tea, decorated by one of the girls. 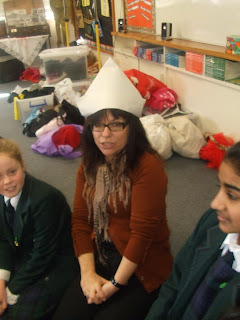 On my second last day the girls put on a surprise morning tea for me, one of them made me a 'guest of honor' hat to wear! And another girl baked me a banana cake because she knew it was my favourite cake. Yesterday they completely overwhelmed me with this beautiful bouquet of red flowers, red because they had asked me earlier in the week what my favourite colour was. They made me a card, decorated with animal print as they knew I loved animal print (I wore something almost everyday that had animal print)! They are so thoughtful! A couple of the girls gave me cards just from them. Needless to say I am going to miss my girls very much!